This spicy peach salsa was an accompaniment to the Coconut-Crusted Tofu dish I made today. It really made the dish something special. I was lucky in that I found a few peaches in the supermarket that weren't rock-hard. I tend to not get peaches very often because of that. I actually went into the supermarket prepared to get a ripe mango because I had little faith in finding ripe peaches. So that is my suggestion to you. 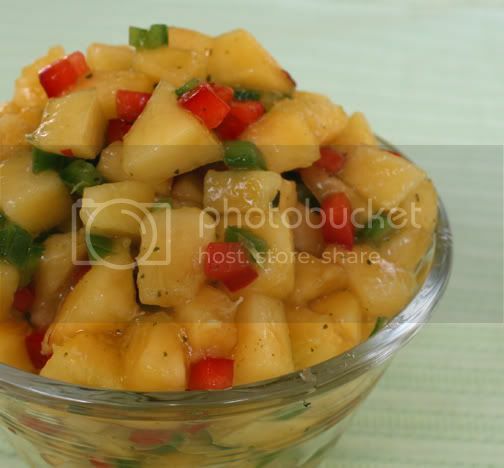 Mangoes actually do have a somewhat peach-like flavor and would be a good replacement in this salsa. If you do end up with mangoes instead of peaches, one is probably enough, depending on which type you get. See my post on how to chop a mango if you are unfamiliar with working with mangoes. Peel the peaches, remove the pits and dice the fruit. 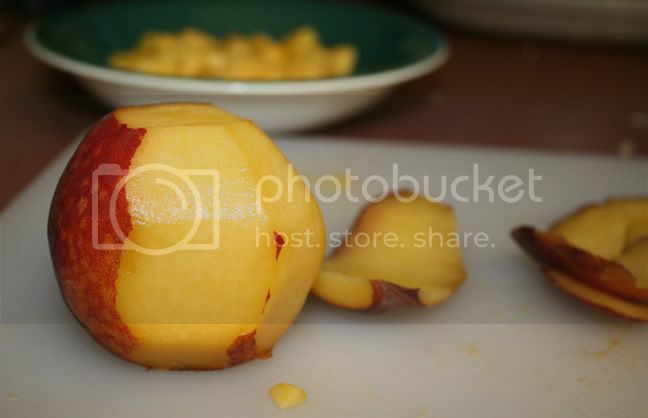 When peeling peaches (and apples), I cut off the top and bottom so I can stand them up and then slice off the skin in a downward direction. Add the peaches and minced peppers to a bowl. Note on dried lemongrass: Being unfamiliar with dried lemongrass, the jar I bought had 3-inch stalks of lemongrass instead of being totally shredded. I found out that once dried, lemongrass doesn't chop. So I ended up making a tea with the rice vinegar in the recipe and my lemongrass. I microwaved it for about 30 seconds and let it sit for several minutes, covered with plastic wrap. I'm guessing that my method worked well. 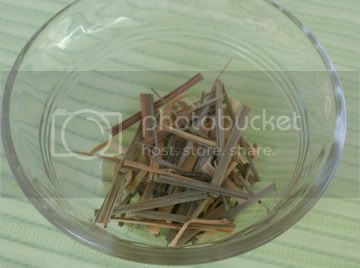 It was very fragrant, and I poured in the tea and through away the remaining hard stalks of lemongrass. As for the basil: I didn't have any fresh. But in my freezer I had one of these packages of tiny little frozen basil cubes that I got from Trader Joe's. I used one cube. 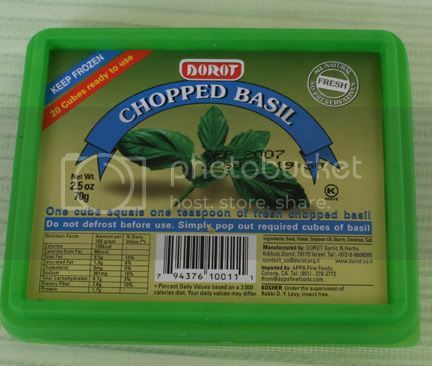 After all, the package says that one cube is equal to one teaspoon fresh basil. 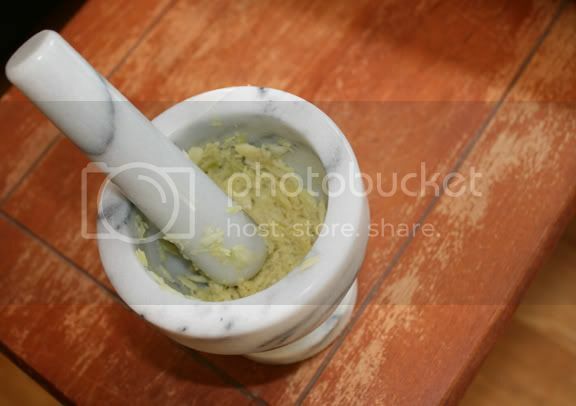 It's so well minced that it looks like pepper - but it's basil! Add the rest of the ingredients and toss to combine.